Since the days of Pythagoras, a challenge in mathematics has been to "square the circle" (find a square with the same area as a given circle) using straight edge and compass only. This topic interests me (of course), since it's the reason I called my math blog "SquareCirclez". 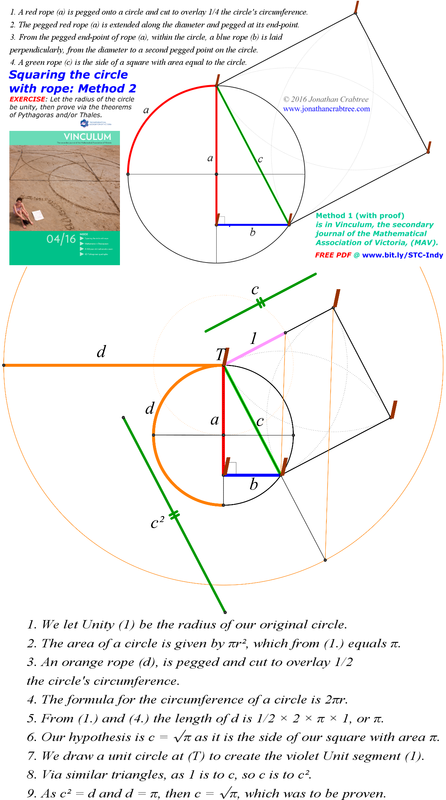 My proof (that the square we construct actually does have side length `sqrt(pi)`) uses Pythagoras' Theorem, and is different to Jonathan's (which uses similar triangles). This is a simple interactive. Step through the constructions and proof by clicking the "Next" button to see how to square the given circle using rope.